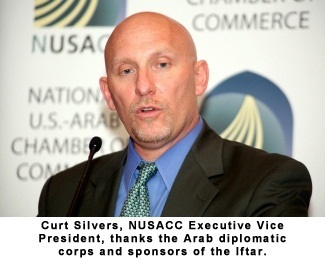 In observance of the Holy Month of Ramadan, the National U.S.-Arab Chamber of Commerce (NUSACC) recently hosted its first Iftar Reception and Dinner in honor of diplomats from the 22 nations of the Arab World and the Arab League Mission to the United States. Over 75 diplomats -- including Ambassadors and other high-level Embassy officials representing Bahrain, Egypt, Iraq, Jordan, Kuwait, Lebanon, Libya, Oman, Palestine, Qatar, Tunisia, the United Arab Emirates, and Yemen -- celebrated Iftar at a gathering of over 200 government and business leaders at the Ritz-Carlton Hotel in Washington DC. Amin Salam, NUSACC's Vice President of Business Development, welcomed guests to the celebration, thanking them for their continued support of the Chamber's work. 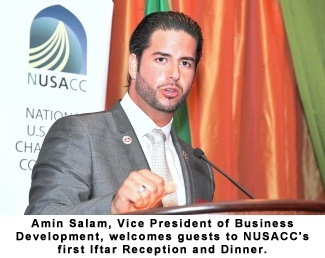 Salam noted, "We are delighted to have everyone here to participate and share in the first Iftar hosted by the National U.S.-Arab Chamber of Commerce. Your being here tonight serves to remind us all just how important our work is, how strong our relationships are, and that working together, we can achieve more." Imam Mohamad Bashar Arafat, Founder of the Civilizations Exchange & Cooperation Foundation, provided remarks about the meaning and values behind the month of Ramadan and about how the tradition is growing and celebrated in the United States, stating, "The month of Ramadan is the month to strengthen the ties within the human family regardless of our color, race, ethnicity, or religion. Ramadan is the month of supplication, prayer, giving, and forgiving." ​Curt Silvers, Executive Vice President of NUSACC, also offered remarks, stating, "Tonight is about refocusing our attention from normal daily activities and instead reflecting on and appreciating more fully our many blessings -- especially you, the people who make up our NUSACC family. Thank you all for your friendship and your support of NUSACC. The ties and friendships we share are truly a treasure." The National U.S.-Arab Chamber of Commerce thanks those who attended the highly popular event, with special thanks to the corporate sponsors that made the event possible: the Ritz-Carlton Hotel, Raytheon Company, and Etihad Airways. Vice President Salam concluded, "We would like to offer a special thank you to our friends and colleagues in the Arab diplomatic corps, one of the most talented, hardworking, and dedicated groups of professionals here in America. We look forward to working closely together to build even stronger commercial and cultural ties among our nations."